Arguably the spectacle of all spectacle films, an enormous achievement of special effects, drama and romance. Merian C. Cooper's story of an ambitious filmmaker looking to capture on-location cinema reality in a remote lost world-type island whose crew encounters a giant vicious ape who has a soft spot for young blondes not only showed us a huge monster battling dinosaurs and climbing the skyscrapers of New York City, but an undeniably sincere romance of beast to woman, and the heartbreaking tragedy of human folly. It's a great opening, a lengthy build up to reveal the big monster. We meet the wily film director Carl Wenham on a ship docked in a foggy New York harbour, figuring out what to do about finding a leading lady for his latest production. He has enough confidence and guile to think he can find a desperate woman on the street in the middle of the night, someone willing to travel across the world for a chance at adventure and fame. Well he find it, in the person of the innocent and determined young actress Ann Darrow. After a quiet cup of coffee, the pitch worked and soon they're sailing toward their mysterious destination. Once there they find the deliciously-named Skull Island inhabited by surley natives who seem to worship some kind of large creature housed by giant wooden doors. When the natives kidnap poor Ann and tie her up to rock in a sacrificial ceremony we finally get to see the monstrous beast which plies the land – a giant ape named Kong. Kong takes Ann into the jungle, an even more dangerous environment with old world dinosaurs and other strange creatures. Carl, his crew and Ann’s new beau Jack Driscoll go into the jungle to save Ann, eventually stunning Kong. When they bring Kong back home he’s turned into a circus performer, as the Eighth Wonder of the World. As we all know, the chains refuse to hold Kong, and he escapes into the city to find his one true love, the luscious Ann Driscoll, while destroying much of art deco Manhattan. One of the miracles of this picture is the life which renowned animator Willis O’Brien creates out of his clay Kong figurine. It seems like rudimentary stop motion with today’s eyes, Kong’s fur constantly shifting around his body even when nothing in happening, for instance, and even the rough transitions between the 22 inch clay Kong and the large scale model of his head for close-ups, but there’s a character there, real emotions, rendered better than any actor in the film. This leads to the heartbreaking finale. 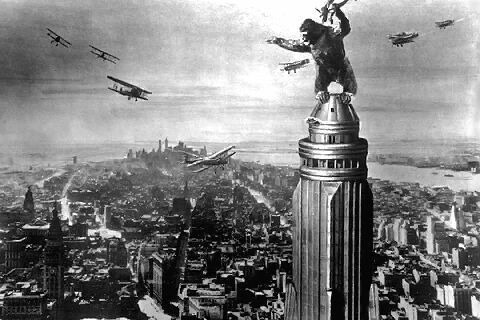 As King Kong battles the biplanes from the tippy top of the world’s tallest building, his feet barely hanging on, on the brink of falling off, a sitting duck target for the machine gun fire of the brutal military instruments of man, not a soul in the world doesn’t feel saddened by Kong’s fate. 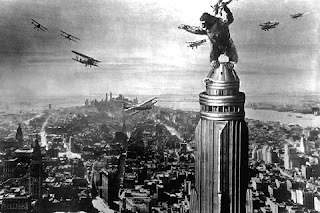 The fact is, King Kong is the tear jerking for guys. Some may say it’s Braveheart or Gladiator. If you don’t get that lump in your throat, or a tear in your eye from watching Kong fall off the building, you’re not a man. Fans of this picture must also check out the pedigree of these filmmakers. There's a bit of King Kong in the other Cooper/Schoedsack pictures, Four Feathers, The Most Dangerous Game, Last Days of Pompeii, and the Merian C Cooper/Irving Pichel production of She.